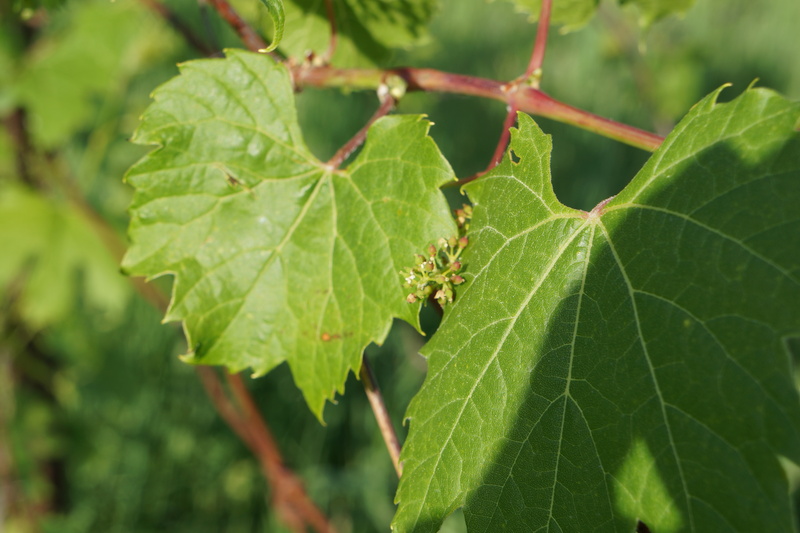 I have already posted recipes for dolmas using leaves from wild grape vines, and really thought I was done. My previous recipes have served me well and I saw no need for any more variations but with a little ground venison at my disposal and a special request to prepare dolmas, I felt compelled to add to my repertoire. You don’t need to use venison in this recipe – any ground meat will work just as well. The spices are what makes these so good, and by using a generous amount of short-grained rice the texture is light. I also feel the need to remind readers that grape leaf season is coming to an end, and this is the time to harvest all you will need for the winter months. The weather has been kind to the vines, and if I’m not mistaken the season has been longer this year than usual. I am sure this recipe could be cooked in an Instant Pot in about half the time, but I opted for the old-fashioned way so I could keep an eye on their progress. However, when cooking these on a stove top, it is useful to line the bottom of a pot with something to protect them from getting scorched. I usually use sliced potatoes, but any root vegetable can be used, and then served alongside the dolmas. This time I lined the pot with corn husks, the same ones I used for making tamales. It also occurred to me that a good thick layer of grape leaves would work and add even more grape leafy flavour. Blanche the leaves in boiling water, drain and set aside. Pour boiling water over the rice and allow to sit for 20 minutes, then drain and let cool. Mix all the ingredients except the leaves together in a bowl. To fill the leaves, place the leaf shiny side down, remove any remaining stem below the leaf. Place about 1 tsp of the mixture at the base of the leaf, fold over once, then wrap the sides inward and continue rolling. To cook the dolmas, you need to stack them carefully in a pot, close enough together they support each other, but loosely enough they can expand slightly. Pour water or stock until almost covered and place a weight on top to press them down. Bring to a boil, then simmer until almost all the liquid has been absorbed, about 1 hour. Categories: edible weeds, foraging | Tags: dolmas, stuffed grape leaves, venison, wild grape leaves | Permalink. 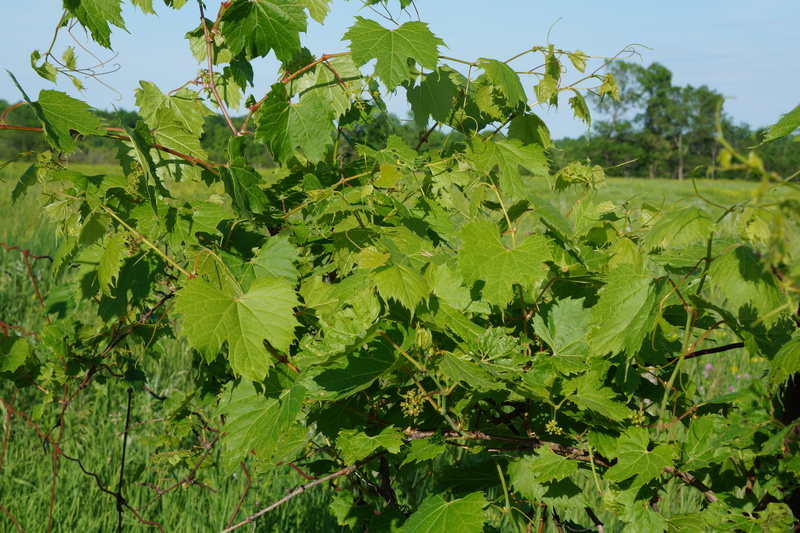 If you have wild grape leaves in your area, this is the best time to pick them while they are still tender and unblemished. I collect them in large quantities and those I don’t use immediately, I blanche and freeze for later use. They are particularly useful in pickles and ferments to help keep vegetables crisp while they also add some good flavour, but can be used in many other ways, some of which you will see in related posts below. For identification, uses and nutritional information, click here for my introduction to them. Long before there was any green on the vines, I began to think what new recipe I could introduce this year, and came up with the idea of a pesto. The first try was a complete success, although I will definitely try it with some variations. 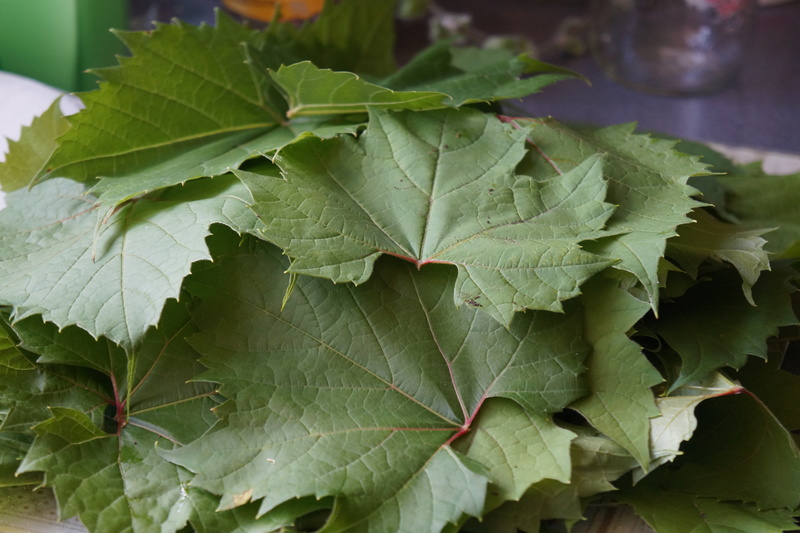 For this recipe I mixed it with nettles to make it greener, as by blanching the grape leaves as I did, they tend to turn a kind of olive colour. Other greens could be used according to what you have available, so feel free to use your imagination. I used black walnuts from our area, but regular walnuts are also fine. I picked very young ones, but when they are mature I recommend removing any of the central stem that looks a bit tough. Blanche the grape leaves and nettles for about 10 seconds. Drain and combine them in a food processor or blender with the other ingredients. This makes a very flavourful pesto which I have enjoyed on pasta, in sandwiches and on crackers, but my favourite is to use it as a base for pizza, spread on an oven-fresh sourdough pizza crust. And then add whatever you like. Related posts: Wild Grape Leaves; Stuffed Fermented Grape Leaves ; Fermented Wild Grape Leaves; Grape Leaves with Roasted Vegetables; Pickerel in Grape Leaves with Mushroom Za’atar Sauce; Quiche in Wild Grape Leaf Shells; Grape Leaf, Herb and Yogurt Pie. Categories: edible weeds, foraging | Tags: black walnuts, Fiesta Friday #228, pesto recipe, pizza, wild grape leaves | Permalink. It’s that time of they year again when the grape leaves, be they wild or cultivated, are ready to be harvested. Last year I described the method for fermenting them and at the same time proposed stuffing them with something. I finally got around to doing it, and while it’s not a hard and fast recipe as such in that you can alter it to your taste, it is a very easy and delicious way to use the fermented leaves. Easier than dolmas to make as there is no stacking or prolonged cooking period, they are just as tasty and make a perfect appetizer or picnic dish. Before I divulge my ‘recipe’, I must point out what I learned from fermenting the leaves. Not only are they arguably the easiest thing to ferment, they have many uses in salads, dips, sandwiches and whatever. What surprised me was that they lasted the entire year without any scary changes, the texture of the leaves and colour of the liquid did not suffer over the winter. I did not even refrigerate them – just stored them in a cool place in the basement. Knowing that, I feel it is worth fermenting an even larger batch this year, which means I need to have even more ways to use them. For the stuffing, I used cooked sticky rice as a base. The only thing to note here is that your rice will be much better if you soak it in water for a couple of hours before cooking it. To the rice I added a little lemon juice, salt to taste, sauteed garlic and mushrooms (I used morels). Chopped roasted nuts, seeds, dried fruit or a combination of any of these would also work very well. Roll the rice mixture in the leaves, vein side up, cover and refrigerate for up to one week in the fridge. I covered them with some loose fermented leaves which work as well as any plastic or aluminum wrap. Linked to Angie@Fiesta Friday, Ai@Ai Made It For You and Jhuls@The Not So Creative Cook. 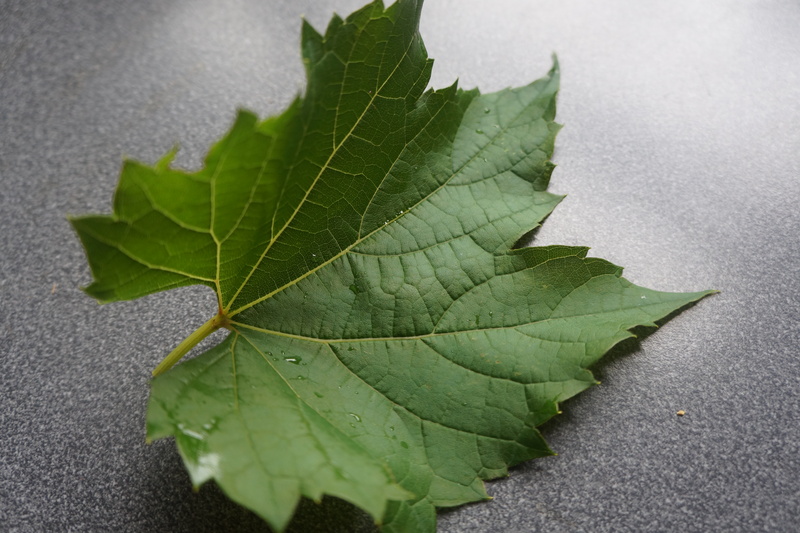 Related Posts: Wild Grape Leaves, Fermented Wild Grape Leaves, Grape Leaves with Roasted Vegetables, Pickerel in Grape Leaves with Mushroom Za’atar Sauce, Grape Leaf and Yogurt Pie and Quiche in Wild Grape Leaf Shells. Categories: foraging | Tags: fermenting, Fiesta Friday, wild grape leaves | Permalink. I couldn’t let this season pass without giving a nod to my signature ingredient – wild grapes. Who knows if there will be any grape harvest with the serious drought we have been experiencing, but the leaves are as lush as ever and begging to be picked. You can read about how to identify them, where to find them and why you would want to here. Always looking for new ideas, I decided this year to ferment them. Fermenting is arguably the most healthful way of prolonging their shelf life, provided they are stored properly. The flavour also gets a boost, – no disappointment there. The only consideration is they do need some acid added to them, so I decided to use a combination of fresh lemon juice and a little liquid from a previous ferment – in this case wild apples. For every two cups of water, I used a heaping tablespoon of salt, the juice of one half lemon and a tablespoon of liquid from fermented apples. If you don’t have any fermented liquid, just double the amount of lemon juice. After removing any trace of stem, I stacked the leaves in piles of five, rolled them like cigars, and placed them in a mason jar. I poured the brine over them to cover and allowed them to sit at room temperature for six days. It is important to keep the leaves completely submerged, so I used a porcelain egg cup, placed upside down on top as a weight. By the sixth day, shorter or longer depending on the room temperature, the bubbling will subside and the liquid will have a good, tart taste. At that point, put a lid on them and store in a dark, cool place. I do not recommend using a square jar like mine as round ones are safer – less likely to succumb to any pressure built up, but I intend to open mine every few days to be on the safe side and let any gas escape. Even in a cool dark place, fermentation will continue so the occasional ‘burping’ is recommended if storing over a long period. Categories: edible weeds, foraging | Tags: fermenting, wild grape leaves | Permalink. I hope I’m wrong, but I suspect there won’t be many wild grapes along the grapevine this year thanks probably to a frost in late May. On the bright side, the leaves are doing fine and at their best for picking now and for the next couple of weeks. As I have described in past posts at this time of year, the leaves can be preserved easily by freezing after blanching lightly. 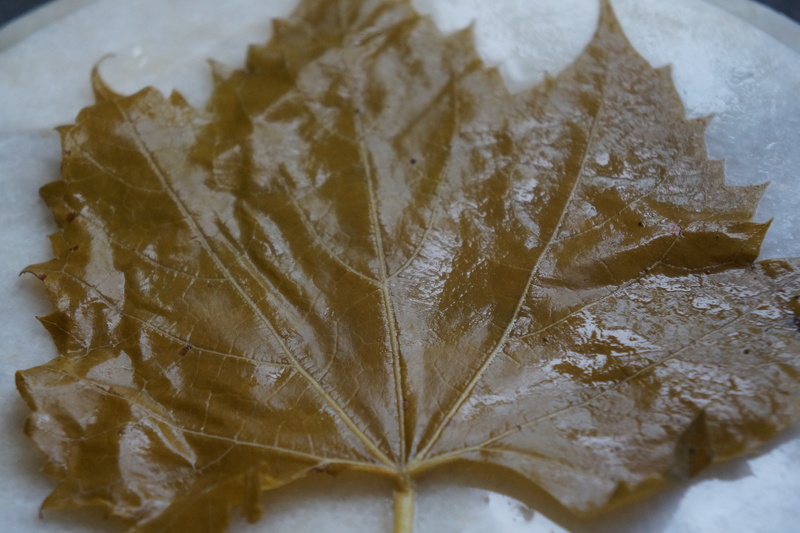 For a change I decided to use fresh leaves for this recipe, but frozen or preserved in brine, which is how they are usually sold in markets, would work just as well. So for Fiesta Friday #72 I wanted to share some of my delectable harvest in the form of a shell for quiche. The custard is a very simple cream, egg and vegetable mixture. You can choose from any type of seasonal vegetable, but I decided to roast the vegetable first. If you have milkweed flowers available, they make a perfect pairing with the flavour of grape leaves, and can usually be harvested in roughly the same place at the same time. However, asparagus would be a fine alternative, and if you live in a part of the world where neither is available, any vegetable will do. But if you are picking milkweed, please bear in mind – given that most milkweed plants have six flowers, you should leave at least three on any given plant so that it will bloom and feed the pollinators, notably monarch butterflies. They should be picked before they open, while they are still green or just beginning to develop a rosy hue. To make these quiches which I baked in muffin tins, first snip off any stem from the base, then brush the bottom side – the side where you can see the veins – with olive oil. Place them in the pans, bottom side up and slightly overlapping. In muffin tins I used two large leaves or three small ones. Brush the vegetables with oil and roast until tender. For the custard, mix thoroughly 2 eggs, 1/2 cup milk, 1/2 cup cream, 1/4 cup grated cheese (I used feta). Stir in about 1/2 cup roasted vegetables chopped. Fill the leaves with the mixture and bake for about 30 minutes at 350 degrees F.
The leaf ‘pastry’ will be brown and crispy. The flavour of the grape leaf is what makes these little quiches so special. Grape Leaves with Roasted Vegetables; Pickerel in Grape Leaves with Mushroom Za’atar Sauce; Grape Leaf. Herb and Yogurt Pie; Vegetarian Dolmas; Dolmas with Meat. Categories: edible flowers, edible weeds | Tags: appetizer, backyard foraging, common milkweed, Fiesta Friday, gluten-free quiche, quiche, wild grape leaves | Permalink. This week I have the privilege of co-hosting Angie’s Fiesta Friday along with Indu of Indu’s International Kitchen and Selma of Selma’s Table. This is the 24th such event, and if you haven’t attended or participated yet, you should check it out. I have come to rely on these gatherings for inspiration and great recipe ideas, and I am sure this week will be no exception. With all the fresh, organic and free for the picking grape leaves just right for harvesting at this time, I decided to bring some along to the party. 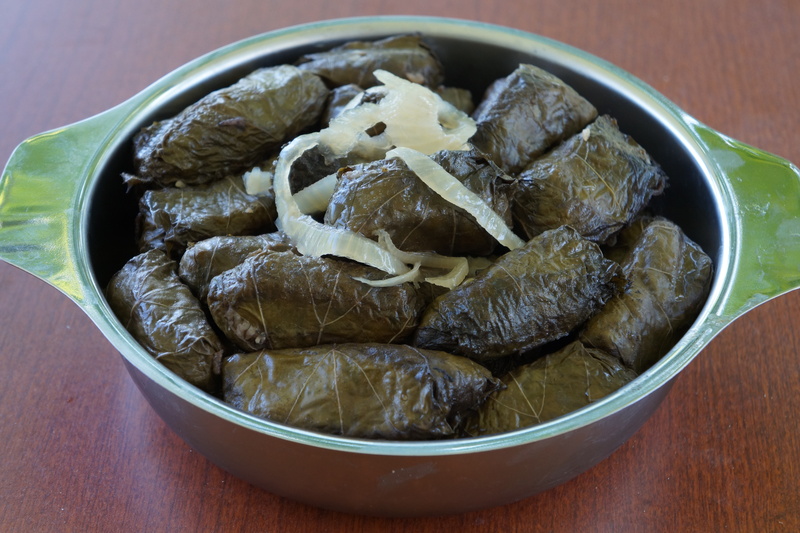 Last year at this time I made a vegetarian version of dolmas, or stuffed grape leaves, with chick peas and rice cooked in a slow cooker. For the sake of variation, I made for the first time a meat version for my omnivore house guests, and instead of a slow cooker used my ‘old’ method which requires no special equipment. First, I picked a bag of leaves – about 4 dozen – choosing good sized ones but still young and unblemished. I blanched them for a few seconds in boiling water, drained and stacked them. At this point, you can freeze them to be used later. To form the dolmas, place one leaf at a time vein-side up and remove any stem. Take a spoonful of filling and place it at the base and in the centre of the leaf. Lift the sides and bottom of the leaf around the filling and fold the edges over the centre. Roll upwards making a nice neat package. Repeat this with the rest of the leaves. Line the bottom of a large saucepan with clean, sliced raw potatoes. This will prevent the dolmas from burning or sticking to the pan. It will also leave you with some delicious potatoes to serve with or as a side dish for another meal. Place the dolmas on top of the potatoes, close together and in layers. Pour cold water over them until it just barely covers the dolmas. Place a heat proof lid or plate smaller than the circumference of the pan but large enough to weigh down all the dolmas so they are submerged. I used a stone cutting board. Bring to a boil, turn down the heat to a medium and allow to simmer until all the water has been absorbed. You can tell when the water is almost used up by the sound, but to be sure I just tilted the pan a little to see how much there was. The total cooking time was about 3 1/2 hours. They can be served immediately, kept in the fridge for a few days or frozen. Mix all the ingredients except the potatoes. Stuff the leaves as illustrated above. Place them in a pan previously lined with potato slices. Add water to barely cover. Place a weight, such as a heat-proof plate or lid on top. Bring to a boil, reduce heat to medium and allow to cook until all the liquid has been absorbed. Arrange in a serving dish and garnish with slices of lemon or pickled onions. Categories: edible weeds, main dish | Tags: dolmas, edible weeds, Fiesta Friday, mint, stuffed grape leaves, wild grape leaves | Permalink.